This degree in International Business allows you to gain the skills needed to launch your own business and manage it in a successful way; you can learn how to become a marketing expert within an international context! This programme offers you two paths: you can decide to focus either on purely international business, or then focus on Fur Design & Marketing. You will be guided throughout the programme by top experts, competent and passionate lecturers, teachers and visiting speakers from the working life. Centria also has a wide network of the guest lecturers from other universities. After graduation from the degree programme in International Business, you have good knowledge about business administration, international business and marketing. You will also have a chance to study languages and acquire therefor valuable communication skills. Classes in intercultural communication will allow to have better insight on how to do business in an international setting. During the first year of studies in international business you will learn the basics of business administration. You will also develop your language and your communication skills. In your second year, you will develop your knowledge in doing business within an international context. The third year will enhance your knowledge on international business, and through the thesis, you can decide to focus on a specific area of expertise. As part of the classes, you will often be working in small team on projects and homework; you will even have the chance to work on some “real life” cases offered by the local business life. Through these, you will gain valuable experience and team-working skills. This path offers the chance to learn how to handle fur and understanding the raw material to designing and making products in fur and leather, all in all – the whole process. Our aim is to let you explore the versatility, usability and applicability of fur. Centria has an extensive support of the fur farmers of the region, fur trade in Finland, professional and international visitors who have worked with us to construct this unique programme. The first year of studies offers an introduction to to the world of fur and leather. Fur can be anything you want it to be. You can study the following modules: Accessories, Home Decoration & Design and Visual Identity. The second year you will become a master of this fabric, through investigation, exploration, researching and recording. You can pick study modules such as: Pattern making, Design Project and Promotion & Marketing. The third year is about mastering this fabric with skills. You will be practicing the systematic process of designing and manufacturing a collection. Also you will be presenting your own theme and research to support the collection. The goal of this project is to introduce the final product into the market, followed by an exhibition and show open to a real public. Through both paths you will gain both theoretical knowledge and practical skills. International Discovering Fur-workshop JAN 2017 arranged in Finland by Centria UAS in co-operation with FurEurope and Profur. The programme is taught in the new Campus Allegro. A few other institutions are located within the same campus, which offers many good possibilities for fruitful collaboration in terms of studies and projects, for instance with the art students from Novia University of Applied Sciences. At the moment we are involved in a project called “Campus Allegro School of Entrepreneurships” which gives good opportunities for cooperation with other students. The university also has close ties to the local business life, which offers good opportunities to students focusing either on international business or fur design. The autumn 2016 intake is the last chance for students from outside of the European economic area (EAA) to study in Finland without tuition fees. By applying in September 2016 and starting your studies at Centria in January 2017, no students will have to pay any tuition for their studies at Centria. For their visa application, students must provide proof for their own living costs, travel expenses and other costs during their studies. The cost of living in Finland is on average comparable to the rest of Europe. Basically, for expenses such as rent, food and personal costs, you will need approximately 560 Euros per month, that is 12 x 560 = 6 720 Euros for one year. Centria UAS does not provide any financial help for students. Centria is located in my hometown, so the decision felt pretty natural for me. Pietarsaari is peaceful and beautiful town!We have lot of students around here during study semesters. The nature is amazing here and we have the sea right by the corner. Also, I knew that by studying at Centria I would meet a lot of different people from around the world. Centria is a very international environment which opens your mind. Being a part of this environment I knew that I would learn much more about business cultures in all over the globe. At Centria, you really have a chance to develop yourself. You will meet people who will teach you a lot as well as you will teach them about your culture. It is a great opportunity to get to know many new people and find life-long friendships. It is very interesting to learn about different business cultures, and not only the one you are used to. In the future I am mostly looking for management positions. I am interested in leadership, to get to manage both people and projects, big or small. After starting studying at Centria I have realized how well managerial work would suite me. My self-esteem has grown a big amount in the past year at Centria so new dreams has been built and I have found new strong sides in me that I know I will have use of in the future when applying for jobs. My studies are supporting my professional goals very well. All the interesting courses we have had tell me every day that this is the right education choice for me. I have finally figured out what I would like to do in the future! 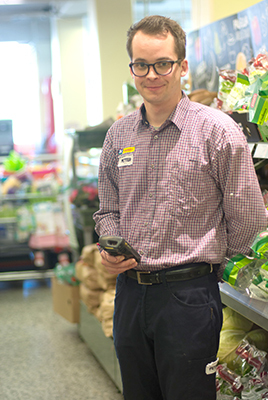 I’ve been working as a Store Manager at my family’s grocery store for the past 6 years and prior to that I worked as a salesperson at an electronics store in Jakobstad. My meetings with customers woke my curiosity about how the minds of consumers work. How they react to marketing efforts and why they are so complex and hard to understand! Often they say that they want something but when it’s time to make a decision they act completely irrational and do the opposite of what they just claimed to be their will! This combined with several other things got me thinking that it might be appropriate to take some time off work and study for a while and I have not regretted my decision! 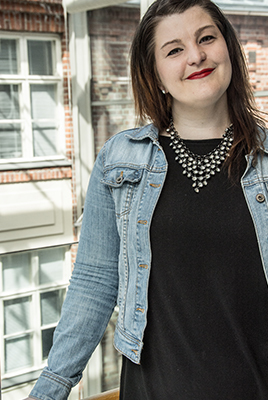 I chose to study at Centria University of Applied Sciences, Jakobstad since it’s located close to home and they provide so called adult education which means that we do a lot of independent work and are not present in school every day. This study method suits me very well since I have the opportunity to plan my studies in a way that makes it possible to either work or spend time with my children when not in school. Something I truly value is my fellow students and the fact that they come from all over the world. Students at Centria UAS have an unique opportunity to get familiar with different cultures and this is, in my opinion, one of Centrias’ finest attributes. Even though Jakobstad is a small town it has a lot to offer. Art and music educations are located at Campus Allegro and that means that there’s lots of live music and cultural events if you know where to look for them. If you enjoy spending time outdoors there are a lot of hiking and mountainbiking trails and in the summer you should definitely pay Fäboda beach a visit! In the winter you can try cross country skiing at one of the many skiing tracks located in either Jakobstad or surrounding municipalities Pedersöre and Larsmo. There is even a ski slope just outside Jakobstad if you prefer downhill skiing or snowboarding instead of cross country skiing. About 56% of the population has Swedish as their mother tounge and 41% has Finnish as their mother tounge. In the surrounding municipalities however Swedish is in a strong majority. Since Swedish is the majority language in the Jakobstad region we are heavily influenced by the latest trends from Sweden. Swedish tv-channels are broadcasted here and many are following the Swedish media, blogs etc. Jakobstad is sometimes called “Little-Stockholm” because of this. And there are other similarities to; a fair variety of cafés, pubs and stores and it is located near the ocean. As I already have mentioned consumer (and human) behavior is something that I find fascinating and I could see myself working in that area in the future. But I am still keeping all doors open, does anyone really know what the future holds? Do we even want to know, do we know what we want? Do we have to know? The phrase “I don’t know” should be used more often. Since I don’t know what I want to do in the future I’m studying, building a solid foundation to take off from the day I figure it out. My name is Jonas Emet, I am 26 years old and I study Business Administration in Pietarsaari. 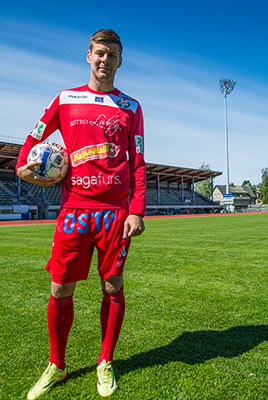 Besides studying, I play football for FF Jaro in the Finnish Football League. I have now finished my first year of studies and think the first year was great.The studies have been demanding, but rewarding, and I feel like I have chosen the right place to study. My choice of Centria, Pietarsaari, was partly due to my football career here, but I also have several friends who have studied here and recommended Centria as a good alternative. The new beautiful Campus Allegro is also a positive factor adding to the fact that I like it very much here. I have not yet decided what I would like to work with, but as a Bachelor of Business Administration there are a lot of work opportunities, which added to why I chose this field. The programme is very educational and I am sure it will be useful in the future, regardless of what I work with. Pietarsaari, from a student’s point of view, differs from bigger cities quite a lot, since it is not as lively. Still, I think people from other places easily fit in, you can find everything you need and people are generally very friendly. Even though Pietarsaari is small, it’s still nice. I can strongly recommend studying in Centria and Pietarsaari! In 2013 I read an article about Finnish higher education and it inspired me to search more information in Internet. There are many feedbacks from Russian student who study in Finland and most of them are extremely positive. They told that education in Finnish Universities of Applied Sciences are based on both practical work and theory. Since those time I decided to do my best and to make an attempt apply for Business Management program in English. The reason I wanted to study at Centria University of Applied Sciences was to get experience in international environment and to get help me to grow and progress in my career. The modules offered are very interesting to me because there is no equivalent in Russian Universities. In addition I consider this program to be a great opportunity to get in touch with Finnish culture and educational system. My current study at Centria includes lots of practical work. I find the method of teaching really positive for students, they learn a lot and feel that teachers trust them. I really enjoy our group conversation as well because I pick up so much information from and about my classmates. I am enjoying my time here so far and hope to find a good job in Fur industry or set my own business in the future. I feel studies would give me a chance to increase my managerial knowledge in an inspiring, creative and cosmopolitan environment at Centria. Furthermore I feel this would help me improve my English and Finnish language skills, as well as my business skills. Moreover, I am confident that my experience in Finland would be extremely exciting and valuable for both my studies and my overall general development. When I made my decision between two options - Fur Design and Business Management I was strongly believed that the second one is better to continue my career path. It seemed more logical solution but I would like change my life, try something new, create something by hand, not sitting with papers during the day. I would make a career move and enjoy to learn Fur handicrafts. If I am successful in my study I prefer to have international experience. When I am about 40, I want to set up my own company or work as a freelancer abroad if possible. If it is not, I am confident that my future degree in Fur Design will be really helpful in Russia because of local climate and Russian's prefers to wearing fur. 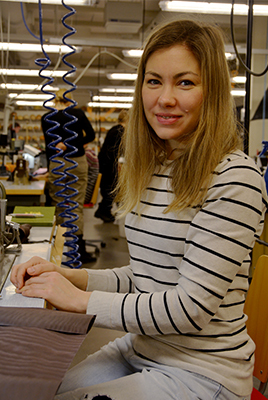 During my previous studies at a vocational school, where I studied tailoring and styling, I took several internships under different designers at various companies in Estonia. I’ve been involved in sewing and designing clothes for children. I worked closely with Marit Illison, a designer and multidisciplinary artist from Estonia. She has showcased her creations also at London Fashion Week. During my internship I was helping her to create fashion shows and exhibitions, including all activities that such comprehensive process requires. Last and the longest internship what I have had, was at the biggest leather and fur company in Estonia called Lindante OÜ where I learned a lot of new fur-specific techniques. I consider designing, pattern-making and sewing of a shearling coat and a backpack made from seal and cow skins as my biggest challenges during that apprenticeship. The main reason, why I applied to that apprenticeship at a fur and leather company, was my long term passion to fur and leather design. I’ve always preferred leather to fabric and real fur to fake fur, I adore materials that come from nature! I’m really glad that I studied tailoring and styling, because I find it really helpful in my future career for constructing fur and leather clothes and accessories. During that internship I visited MIFUR, Italian Fur Association’s gala show and REMIX final show. This inspired me to take part of next REMIX contest and directed me even more to attend into fur trade. I found out about Centria University of Applied Sciences accidentally from one of the owners of the Fur and leather manufacturer where I had an internship since the fur factory is connected with Ostrobothnia farms a lot. I ended up at Centria because of the international Fur Design and Marketing studies Centria is offering. What I most love about the fur design studies is the variety of options and free will of doing them. Because teachers love students trait of character and their aim is not to change their personality but try to find the best of everyone. Pietarsaari is a very nice city to study, since it has a lot of sides considering the size and the population of the city. There you can find a lot of cultural and musical events and sightseeings. Since it is a student town what offers international studies there are a lot of foreigners. I have a very strong desire to study and deal with fur issues in my further education and career. I’m convinced that fashion will follow me through my life and I certainly want to develop myself and be as good as even possible.